If you work in software development, you can advance your career this Summer by taking advantage of discounted rates on some of Intertech’s most popular dev classes. Through September 2015, earn up to a $500 Amazon Gift Card* or up to $500 off the price of each class registration for any Intertech training class*. Class must be taken by end of September and registered for by August 31st, 2015. My thanks to the Star Tribune for running my article “Turning tech-using teens into dreamers and developers” in the Business Forum section. Last time I shared news about Intertech’s new philanthropic focus on science and technology learning. I also mentioned the new $2,500 scholarship being funded by the Intertech Foundation for an aspiring computer science freshman college student. And I promised to delve more deeply into the topic of computer science careers. Software engineer and computer systems analyst ranked 7th and 8th with midlevel income listed as $93,350 and $79,680 respectively. Among the reasons for their high rank: low stress, great work environment and positive job outlook. If these jobs are among the best paying, with the lowest stress and strongest job outlook, why is there a shortage of qualified programmers for companies like Intertech to hire? Now for the truly weird part, at least to me! According to recent news reports, there is no lack of qualified people to fill these jobs—software engineers in particular. “What STEM Shortage?”, an article in the National Review (5/20/14), states that “the sector isn’t seeing wage growth and has more graduates than jobs.” This article cites reports by the Economic Policy Institute, The RAND Corporation, the Urban Institute and the National Research Council. The Atlantic magazine also has a piece this month, “The Myth of the Science and Engineering Shortage,” that bears checking out. It’s difficult to argue with such formidable sources, but it’s also hardly a secret that there’s a shortage of outstanding software engineers in Minnesota. Intertech employs several full-time recruiters who beat the proverbial bushes with vigor to find and engage them. We also work hard to be a great place to work and have received three awards this year alone validating our efforts. But still we struggle to find enough high caliber people to fill these excellent positions. A one-page essay describing how the student hopes to participate in the professional software development industry. Two letters of recommendation, including at least one from a science or math teacher who knows the student well. A resume describing academic, extracurricular and employment experience. Description of any involvement in the FIRST Robotics program (not a requirement but it does mean extra points in our scoring process). Why all the hoops if the student has good grades, a strong GPA and interest in programming? We want to cultivate well-rounded professionals who not only understand how to code, but also can communicate verbally and in writing. We want to hire people who can work with others and are not afraid to raise their hand and get involved. In other words, we want leaders with strong technical skills. That’s a tall order but if we don’t set the bar high, who will? Some have opined that cultivating U.S. students with strong technology and leadership skills not only has implications for workforce development, but also for national security concerns and immigration policy. I’ll leave those global issues to the think-tank leaders to sort out, even as I remain passionately committed to the development of the next generation of technology leaders. Our clients expect the best and we intend to keep delivering it! Maybe it has something to do with becoming a dad—or maybe it’s just the good ‘ole enlightened self-interest of a technology business owner—but in the past year I’ve help guide an expansion of Intertech’s philanthropy and the giving focus of the Intertech Foundation to include science and technology learning for young people. Specifically, Intertech (the company) became a sponsor of the FIRST Robotics Minnesota regional high school tournaments in Duluth and Minneapolis. In addition, Intertech Foundation provided 50 grants to individual FIRST teams across the country. And, most recently, the Foundation has begun funding a $2,500 college scholarship to help an aspiring computer science student with his or her first year of academic expenses. We plan to make our first award to a worthy student beginning college in the fall of 2015. We don’t expect our philanthropy efforts to single-handedly turn the tide of frequently disappointing math and science scores among U.S. high school students. Fortunately, we do not have to carry the burden alone. Thousands of new programs exist to encourage K-12 students to do better in these areas and, equally important, to understand the important connection between STEM education—science, technology, engineering and mathematics—and great career opportunities. (I will explore the STEM/career angle more in my next post). You’ve probably read about the movement to teach kids software coding skills. There’s a good video (Ted YouTube channel) featuring Mitch Resnick from the MIT Media Lab on the importance of helping kids to become “fluent” with new technologies. He describes how learning to create software builds problem-solving, creativity and communication skills. I couldn’t agree more. Many mistakenly assume kids are “digital natives” Resnick explains, but he rightly points out the difference between using technology and having the skills to make it. He uses the analogy of being fluent in a foreign language: it’s one thing to read it and quite another to speak or even write it. The latter is the goal of MIT’s Scratch software program, which demystifies computer coding and makes it fun and easy for anyone to be creative with software (check it out on the MIT website and share your projects with me here!). I think it’s clear the first part of that goal has been recognized. Who ever would have predicted that “geeks” would be “cool”? The success of smart phones, iPads and social media platforms like Facebook and Twitter tell us how much our world has changed since 1989. I don’t believe the second part of Kamen’s goal has been realized however. How many kids dream about becoming science and technology leaders? Could it be the disconnect between understanding how technology really works and how fun it is to use that keeps young people from pursuing such a path? Do they fail to grasp the incredible career opportunities and lifestyle benefits available to people in the computer science field? Hope you’ll join me next time for a further exploration of this issue. With Intertech’s training sweepstakes, we’re giving away $10,000 worth of training for a team of up to four IT professionals. Throw your hat in the ring and register today! Thanks to Jim White, my business partner, you can learn Raspberry Pi development in a series of 10 Raspberry Pi programming workshops on Intertech’s blog. If have a kid involved in a Lego or Robotics League in Minnesota, watch Intertech’s website for our upcoming announcement of our support program for up to 50 teams. In addition, we are going to help sponsor the Minnesota First Regional competition in March ’14 at the University of Minnesota. Watch our website for the announcement of our upcoming scholarship. Offered to an undergraduate computer science or STEM student, the Intertech Foundation will be awarding $2,500 to an undergrad student in ’14. 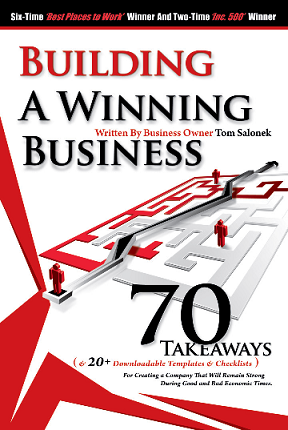 Finally, for everyone (no application or sweepstakes required), I’m giving away a copy of my book Building a Winning Business. Feel free to share this post or the link to the PDF. Let’s make it a great ’14!